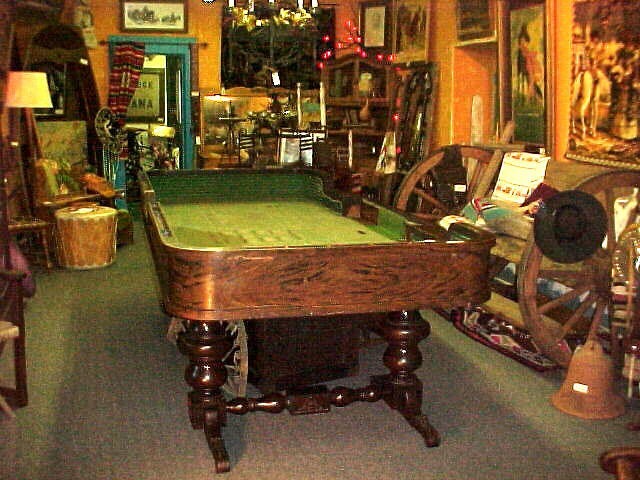 This is a genuine historic Craps Table 10'ft 6"inches long and 5'ft wide. Just to stand by it and throw the oversized dice you can almost hear the crowds and imagine the smoke and the sounds of the game. It is a wild west experience to play on this craps table. Stain from some spill is present and can be seen in pictures. But who cares. This is one of the rarest gambling collectibles. This item would go great in a saloon, in a business or in a home that has a recreation room or Saloon. Lay out on the floor how big the measurements are to get an idea how big and dynamic it is in all it's glory, even in "used condition." Email for info and to order call . 1890-1910. Be sure to check out other pictures on website of table. Condition of top and sides are worn, and it needs to be restored. Normally a gambling supply house can provide a new cover lay out for the table and sides with new materials. But I am leaving that up to the buyer to decide. Where will you find another except in a museum. New bumper surrounds can be order for additional $500. Feel free to request more pictures if serious. 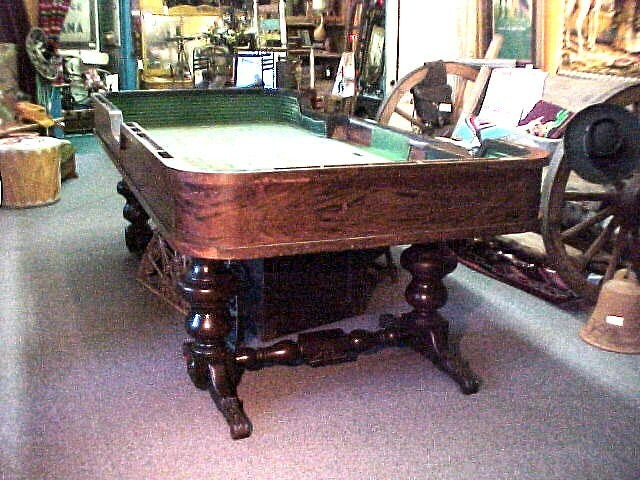 This is a genuine historic Craps Table 10'ft 6"inches long and 5'ft wide. Just to stand by it and throw the oversized dice you can almost hear the crowds and imagine the smoke and the sounds of the game. It is a wild west experience to play on this craps table. Stain from some spill is present and can be seen in pictures. But who cares. This is one of the rarest gambling collectibles. This item would go great in a saloon, in a business or in a home that has a recreation room or Saloon. Lay out on the floor how big the measurements are to get an idea how big and dynamic it is in all it's glory, even in "used condition." Email for info and to order call . 1890-1910. Be sure to check out other pictures on website of table. Condition of top and sides are worn, and it needs to be restored. Normally a gambling supply house can provide a new cover lay out for the table and sides with new materials. But I am leaving that up to the buyer to decide. Where will you find another except in a museum. New bumper surrounds can be order for additional $500. Feel free to request more pictures if serious. Please email cowboyron@cowboycabin.com with questions or call 406 270-2842.